The Rice Executive MBA program is meant for professionals with management experience who want to take their career to the next level. This is a 22-month program. Classes are held Fridays and Saturdays over alternating weekends. The program includes four one-week intensives, executive seminars, a first-year core curriculum, an elective block, a global curriculum feature, and pre-program online leveling preparation course. The Executive MBA gives business professionals the chance to add to their skillset through hands-on learning opportunities. Students will complete core classes during their first year, and then spend the second year focusing on electives that are specific to their interests and career goals. In addition to these classes students will take part in intensives that last for five days at the beginning and end of each year. During these intensives students will focus in-depth on a particular business-related topic. Throughout the program students will have access to one-on-one coaching sessions with executive professionals. An international capstone project will take place at the end of the program. Students may also choose to specialize their degree with a Health Care Specialization Track. Approximately 62 students recently enrolled in the Rice University Jones Graduate School of Management Executive MBA program. These students are, on average, 41-years old, have 17 years of previous work experience, a 636 GMAT score, and a 3.09 undergraduate GPA. The class is comprised of 24 percent female students and 17 percent U.S. minority students. The current average income of Rice EMBA students is $176,319 with nearly half of the class having previously earned advanced post-graduate degrees. 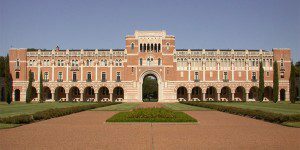 The projected tuition for the Rice University Executive MBA is $129,000. Students pay 25 percent of the tuition each of the four semesters. Once accepted a student must pay a $5,000 deposit. Tuition may be covered by the use of personal resources, Federal Student Loans, private student loans, or a Semester Payment Plan available through the Cashier’s Office. Many students in the MBA for Executives program cover their tuition needs through their company’s financial support. Rice encourages applicants to check with their company regarding education benefits and tuition reimbursement programs. Complete an online application, one personal essays, a professional resume and official test scores submitted to the Jones School (GMAT, GRE, TOEFL, or PTE Academic). GMAT, GRE, and English proficiency exam waivers are granted on a case by case basis for Rice’s EMBA program. Applicants are also required to provide one confidential evaluation submitted to the admissions office provided that this one evaluation is from the applicant’s current, direct supervisor. If this one evaluation is not from a current supervisor, applicants are required to submit two confidential evaluations. Applicants also need to provide official transcripts of all degree-granting institutions. There is a $200 application fee payable online or by check.